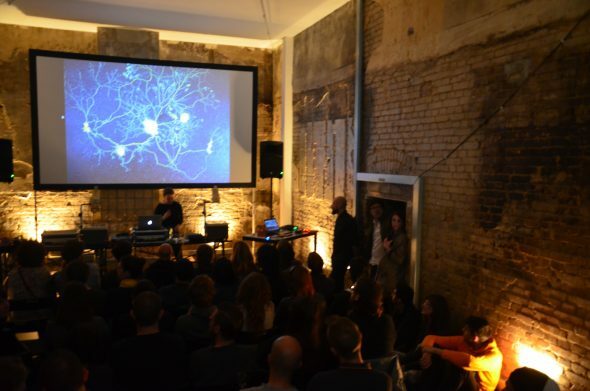 As a cosmopolitan city, Berlin is able to provide the right atmosphere for community building. Indeed, the city attracts many different people from around the world, and has impressively developed its cultural scene during the last decades. Spektrum fits perfectly within this Berlin ethos. SPEKTRUM is an open space with the aim to link art & science, and also connect people from different backgrounds through a rich and various program composed of events, performances, and exhibitions. The space and its organizers welcome everyone curious to admire this atypical venue. It is located in a monumental building recently renovated in the heart of Kreuzberg/Neukölln (designed by Franz Hoffmann and Bruno Taut, one of the main expressionist architects of the modernist period). The inner space is characterized by a multi-layered approach, with an unusual five-meter high ceiling for the event room and other sections organized at split-levels. These architectural qualities tell us a story of planes and volumes, offering visitors a surprising walk around with secret spots to discover. Lieke Ploeger and Alfredo Ciannameo came together to start this project in 2014. Ploeger (community builder) has been involved in various European research projects in the fields of digitisation of cultural heritage and digital humanities. Ciannameo (media artist) has cultivated a strong interest in the intersection between physics and sensory immersive experiences. He took part in various exhibitions in the Netherlands, Italy, Germany and Brazil. With their complementary profiles, the founders of Spektrum are helping people to connect, share knowledge, learn and get inspiration from each other to create new interdisciplinary work. The original purpose was focusing on creating a link between art & science with experimental art, media art, performative art. Nevertheless, today the project has grown and hopes to go further by attracting new partners engaged in hacking, activism, or journalism, among other fields. From January 22–24 2016, an audiovisual performance programme will take place at SPEKTRUM. As part of CTM/Transmediale Vorspiel 2016, Amsterdam-based FIBER will organise a night of audiovisual performances, a screening programme and arrange an artistic meet-up. 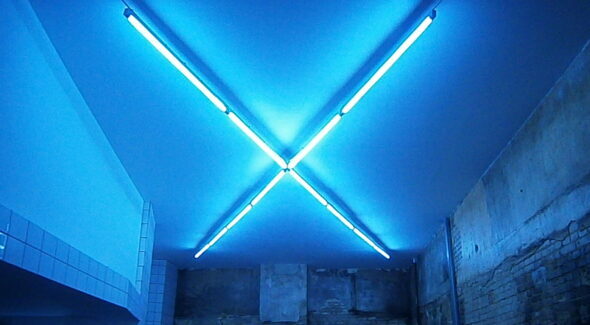 The event is co-created with Fiber festival, Berlin-based Retune, the iii initiative and Spektrum’s local communities. As a cultural exchange, this event represents an ongoing research trajectory to setup an artistic production network for emerging artists between European festivals. On Sunday January 17th Spektrum will host a panel discussion around ‘Verifying Art and Science’, with renowned artscientists Evelina Domnitch, Dmitry Gelfand and Theresa Schubert. Spektrum is expecting to continue to develop this creative community and raise the number of active partners. This open space is presenting art work to a wide range of visitors, but above all, they want to give something back to their contributors. the communities around topics such as olfactory art, live cinema and sonic coding offer them a way to get involve and get active outside of Spektrum as well.